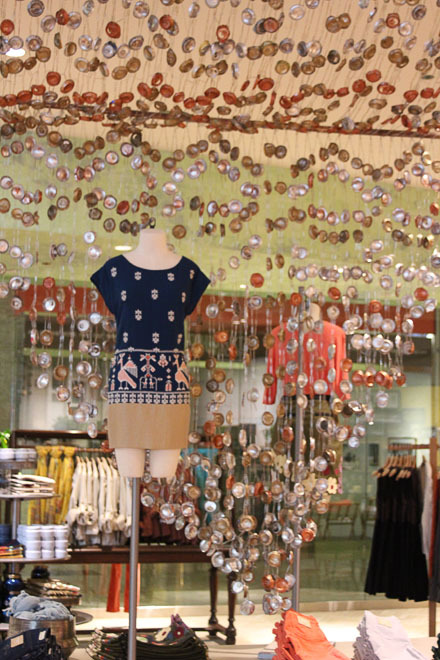 In the summer of 2012 I interned at the Block 37 Anthropologie store in Chicago working with their visual displays. he "Fall" concept for the bottom floor of the store was "Hazel" -- the name of a fictitious free-spirited textile designer. The tapestry shown here that we made out of the tops and bottoms of pop cans is meant to resemble an ikat design -- with a DIY aesthetic. For the "Summer 2" window the concept was florals. These "flowers" consist of paper mache "buds" (made out of coffee filters and string), little wire "stems" covered with masking tape which is painted green, and larger "stems" made out of melted PVC pipes painted different shades of green. The largest "stem" connected to the floor is not pictured, but it is also made of four melted PVC pipes painted green and covered with a special pulp (also painted green) to give the pipes texture.